How popular is the baby name Allison in the United States right now? How popular was it historically? Find out using the graph below! Plus, check out all the blog posts that mention the name Allison. The Top Baby Names in Maryland in 2011? Maryland’s Open Data website includes a single table of Maryland baby name rankings (2011) broken down by race/ethnic group. This is cool because New York City does the exact same breakdown, and we happen to have the equivalent NYC baby name rankings (2011). So we ought to be able to compare and contrast the two sets of rankings, right? Yeah, that’s what I thought…until I started looking more closely at Maryland’s data. It isn’t totally implausible that Aiden and Jayden might have ranked 1st and 3rd in 2011, but Christopher in 2nd? Maybe if this were a dataset from thirty years ago, but not five years ago. The SSA indicates that Christopher ranked closer to 18th in the state that year. And what’s with the two different spellings of Jayden/Jaiden? Not only does Isabel magically replace Isabella in the Maryland data, but McKenzie and Riley rank 8th and 10th — even though the SSA says they should be closer to 77th (!) and 28th. Intriguing parallels between the MD data and the NYC data do exist. In both locations, Elijah and Isaiah were in the top 10 for African-American boys only, and London, Aaliyah, and Taylor were in the top 10 for African-American girls only. But if we can’t trust the data, we can’t draw any meaningful conclusions. 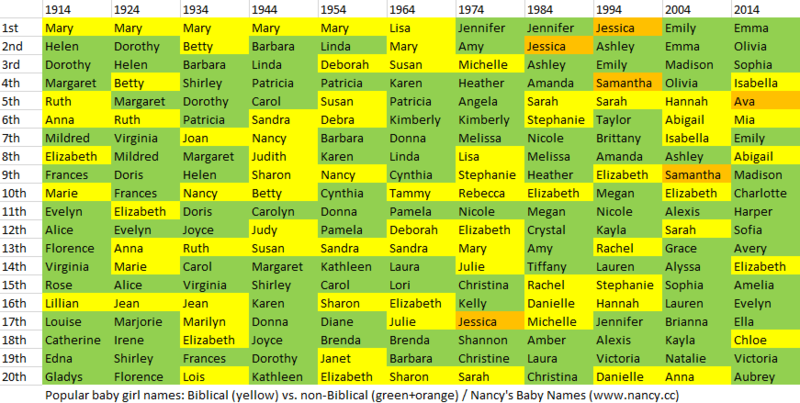 Labels like “Caitlin/Kate,” “Sara(h),” “Zoe(y)” and “Lillian/Lily” suggest that variant names were combined here and there. I suspect this is also what happened with Isabel/Isabella, Sophia/Sofia, Aiden, Jayden, MacKenzie, Riley, and maybe even Christopher (perhaps Maryland merged all the “Chris-” names). What are your thoughts on this? Emma and Noah were the most popular baby names in the United States in 2014. Noah remains the #1 boy name, and Emma replaces Sophia as the #1 girl name. On the girls’ side, Charlotte replaces Elizabeth (now 14th). Elizabeth hasn’t dipped this low since the late 1970s. On the boys’ side, James replaces Jayden (now 15th). James was last in the top 10 in the early 1990s. On the girls’ side, Ariana, Penelope, Skylar and Nora (previously ranked 54th, 56th, 73rd and 82nd) are new to the top 50. They replace Hailey, Kaylee, Alexis and Nevaeh (now ranked 51st, 52nd, 64th and 65th). On the boys’s side, Oliver and Aaron (previously ranked 52nd and 51st) are new to the top 50. They replace Brayden and Gavin (now ranked 62nd and 60th). The biggest jumps within the top 50 were Scarlett (+12 spots), Sebastian (+11) and Aria (+9). The biggest drops within the top 50 were Aaliyah (-10), Christian (-7), Ryan (-7) and Nathan (-7). Here are the announcement posts for 2013, 2012, 2011, 2010, 2009, 2008, 2007 and 2006.